Joel Matip bagged a beauty of a header this afternoon, as he put Liverpool two goals to the good against Southampton at Anfield. 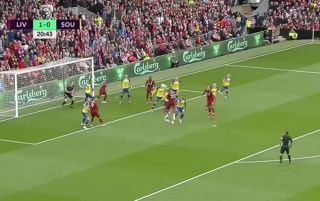 The Reds took the lead through an own goal from Welsey Hoedt, before Matip’s header gave the home side a two goal advantage. The Cameroon international’s goal was a beauty, as a Trent Alexander-Arnold corner found the head of the defender, whose effort soared into the top corner. Liverpool fans will be delighted with the start their side have made this afternoon, as it looks as they’re well on their way to maintaining their 100% start to their league campaign. Here’s a clip of Matip’s fantastic header against the Saints. Will we see a better headed goal today? Probably not.